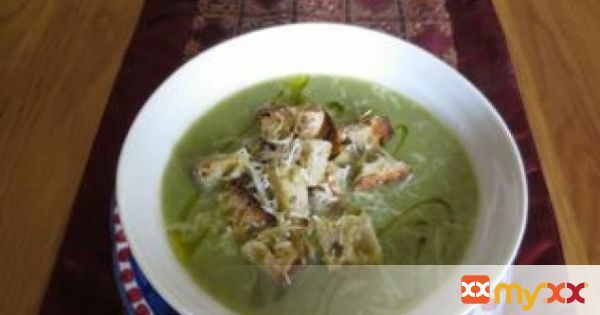 Broccoli is good for us and delicious - try this spiced up gorgeous broccoli soup. 1. Roughly chop the broccoli. 2. Peel and dice the potato. 3. Finely chop the onion. 4. Heat olive oil in large saucepan and add the onion and gently cook for 2 minutes. 5. Add the crushed garlic and chili flakes. 6. Cook gently for another 2 minutes. 7. Add the diced potato; stir well and cook gently for 2 minutes. 8. Add the broccoli and season with salt and pepper. Stir well and gently cook with lid on saucepan for 10 minutes. 9. This 'pan roasting' of broccoli helps bring out flavor before adding liquid but stir frequently so it doesn't catch on the bottom of the pan. 10. Add enough stock or water to cover the vegetables, bring to boil and then simmer gently with lid on for about 30 minutes or until the vegetables are tender. 11. Blitz with hand blender, check seasoning. 12. Make cheat croutons by toasting thick slice of bread, drizzle generous amount of olive oil over top and dice. 13. Ladle soup into serving bowl. 14. Put croutons in middle and grate of some Parmesan. Delicious, warming and very nutritious!